I don't know about your family, but my kids enjoy munching on carrots for a snack or as part of their school lunches. In fact today they requested carrots and ranch as part of their snack to take to cheerleading camp today. Health Benefits: Carrots are an excellent source of antioxidant compounds, and the richest vegetable source of provitamin A carotenes. Carrots' antioxidant compounds help protect against cardiovascular disease and cancer and also promote good vision, especially night vision. Carotenoids and Heart Disease: When six epidemiological studies that looked at the association of diets high in carotenoids and heart disease were reviewed, the research demonstrated that high-carotenoid diets are associated with a reduced risk of heart disease. In one study that examined the diets of 1,300 elderly persons in Massachusetts, those who had at least one serving of carrots and/or squash each day had a 60% reduction in their risk of heart attacks compared to those who ate less than one serving of these carotenoid-rich foods per day. Better Vision: Beta-carotene helps to protect vision, especially night vision. After beta-carotene is converted to vitamin A in the liver, it travels to the retina where it is transformed into rhodopsin, a purple pigment that is necessary for night-vision. Plus beta-carotene's powerful antioxidant actions help provide protection against macular degeneration and the development of senile cataracts, the leading cause of blindness in the elderly. Carotenoids and Blood Sugar: Intake of foods such as carrots that are rich in carotenoids may be beneficial to blood sugar regulation. Research has suggested that physiological levels, as well as dietary intake, of carotenoids may be inversely associated with insulin resistance and high blood sugar levels. Carrots are hardy vegetables that will keep longer than many others if stored properly. The trick to preserving the freshness of carrot roots is to minimize the amount of moisture they lose. To do this, make sure to store them in the coolest part of the refrigerator in a plastic bag or wrapped in a paper towel, which will reduce the amount of condensation that is able to form. They should be able to keep fresh for about two weeks. 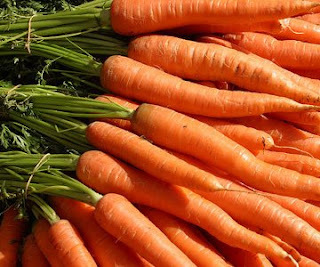 Carrots should also be stored away from apples, pears, potatoes and other fruits and vegetables that produce ethylene gas since it will cause them to become bitter. Carrots and Pesticide Residues: Virtually all municipal drinking water in the United States contains pesticide residues, and with the exception of organic foods, so do the majority of foods in the U.S. food supply. Even though pesticides are present in food at very small trace levels, their negative impact on health is well documented. The liver's ability to process other toxins, the cells' ability to produce energy, and the nerves' ability to send messages can all be compromised by pesticide exposure. According to the Environmental Working Group's 2009 report "Shopper's Guide to Pesticides," carrots are among the 12 foods on which pesticide residues have been most frequently found. Therefore, individuals wanting to avoid pesticide-associated health risks may want to avoid consumption of carrots unless they are grown organically. What are baby carrots? In North America, baby carrots are grown-up carrots chopped into smaller pieces and peeled. After harvesting, the carrots are washed in chlorinated water similar to tap water and cleaned to remove dirt and mud. Some finished baby carrots are washed, or dipped in a stronger chlorine solution to prevent white blushing once in the store. Due to the amount of waste in producing baby carrots and the chlorine dipping process, althought it is a little less convenient, the best way to prepare raw carrots would be to buy a bunch of full grown organic carrots, peel and cut them into sticks yourself. I know, it takes a little more time, but they will be better for you and your family!